Days #76 started off just after midnight. 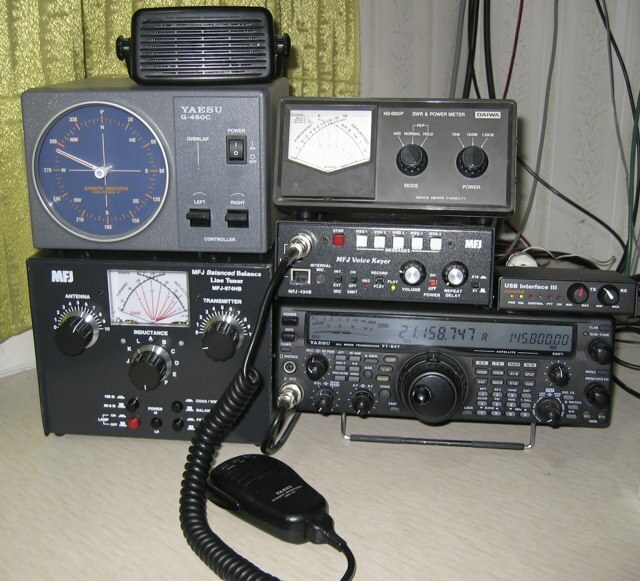 Now I appreciate that one day always follows the previous but in the case of day #76 it started on the wireless at 00:05 when I worked OX3XR, Peter in Greenland on 40m JT65 for a new DXCC. 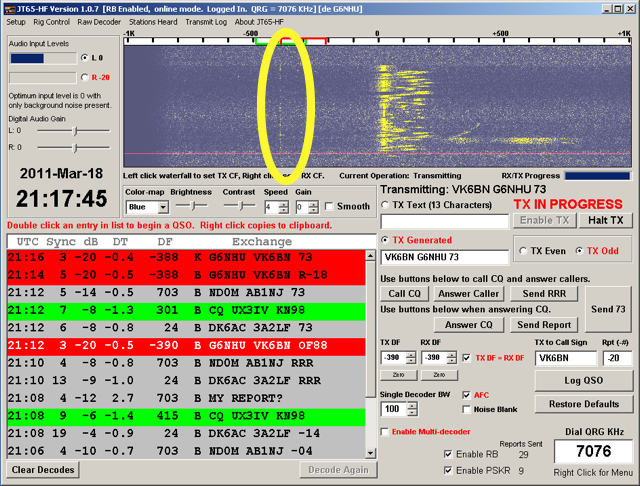 That was followed by VE3ZUP in Canada on the same band and mode. I was still at home during the day so once I’d been to bed, slept poorly and then arisen later, I worked RX3DQX, Vladimir on 20m followed by NM1J, AB0DI, RX3AKA, OE1BHS and EB3JT all on 20m JT65. I made a note in my log that Yuri, RX6AKA has a great tattoo which you can see on his qrz.com page. On day #77 I was back at work although I really wasn’t in a fit state to be there so I left and came home early. In the evening I had three QSOs on JT65, the first was with IW5ALG, Gianni on 40m and then I worked UX3IV, Nick followed by VK6BN again on 40m. This time I took a screengrab of my QSO with Alan and you can see it below. You can see that I was calling CQ and Alan, VK6BN answered. He was weaker than last time and I’ve highlighted his trace on the screen, it’s barely visible. I ran 40m QRSS overnight and the results of that have already been posted on this blog here and here. It was a successful evening. On the morning of day #78 I awoke feeling much better than the three previous days, I had no idea what to expect on the radio so I slapped it on as usual and first worked IZ5PNL, Simone on 20m. Shortly after that I had a text from a very good friend of mine, Yan, M0YNK saying “15m wide open”. My long wire doesn’t work particularly well on 15m so I replied “Not on my wire”. My phone then rang. Yan suggested that I plug my 5/8 vertical in and use that on 15m and that it should work well. I replied “I can’t, I don’t have a tuner” *pause* “I DO have a tuner!” Because I’ve not had a chance to sort out my doublet yet I’d completely forgotten about the MFJ-974HB that I’d been loaned by my sponsor, Martin Lynch & Sons Ltd.
Excitedly I removed the tuner from the box and set it up in the shack. It all goes together quite nicely and I now have a little wall of radio equipment next to me here. I tuned the aerial on 15m and Yan was right, the band was full of people calling CQ contest. Throughout the day and the evening I worked 70 stations in the contest on 10m, 15m, 20m, 40m and 80m. Because of the number of stations worked, I’m just going to list bands and callsigns. New DXCC entities are highlighted in bold, six for the day. During the day I also worked RX3AIS, Mikhail on 15m JT65. This entry was posted in Amateur radio, Contesting, CW, HF, JT65, New DXCC, QRSS, QSO365, Sponsorship, SSB and tagged QRSS, QSO365. Bookmark the permalink.